Plato called Sappho of Lesbos the Tenth Muse. Hence, The Tenth Muse is named for the poet. Today, with her works in fragments, we can only marvel at what was saved and hope that someday more of her complete poems will be discovered. The membership of The Tenth Muse may post poems by poets of any period and submit their own poetry. This emphasis is on the appreciation of poetry, discussion and free exchange of poetry without unwarranted criticism. 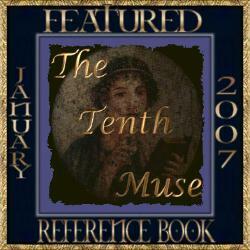 In January 2007, The Tenth Muse was chosen as the Reference Dailies Featured Book! Congratulations Members!